Royal North Shore Hospital designed and implemented an efficient, patient-centred model of care in the transit lounge, which improved patient flow and satisfaction. To ensure 35 per cent of patient discharges at Royal North Shore Hospital flow through the transit lounge, by July 2018. To ensure 100 per cent of patients transferred to the transit lounge at Royal North Shore Hospital have a positive experience that completes their hospital journey, by December 2017. Facilitates an efficient and centralised discharge process. Improves bed access in the emergency department. Enhances and completes the patient’s healthcare journey. Makes it easier for patients to be picked up by family or carers. Improves the comfort of patients while they wait in the transit lounge. A transit lounge is an area in the hospital where discharged patients can relax while waiting for transport home or to another facility. The transit lounge at Royal North Shore Hospital was run by the Acute Assessment Unit until March 2016. Since then, the Patient Flow Unit has taken over the management of this service. The transit lounge can improve patient flow and provide better access to acute beds, as well as improve the patient experience by helping patients leave the hospital in a timely manner. However, following the transition, a number of inefficiencies were identified. Royal North Shore Hospital is a 750-bed tertiary referral hospital, with an average of 100 discharges per day. Prior to the project, only around 15 discharged patients flowed through the transit lounge each day and less than two patients arrived prior to 10am. In addition, the emergency treatment performance (ETP) of the hospital was below NSW Health benchmarks. As part of a whole of hospital approach, the transit lounge was identified as an area with the potential to significantly impact patient flow and improve ETP. 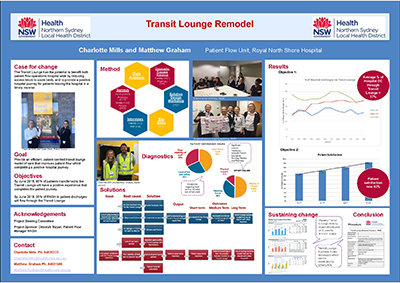 In May 2017 patients and staff were consulted and engaged to understand current issues impacting on patient flow into the transit lounge and the patient experience. Patients were surveyed (N=50) with questions addressing practical needs and following a 'what matters to me' framework. Following this two patients were interviewed to gain further insight into the issues raised through the surveys. Staff were engaged primarily through surveys (medical n=62, nursing n=62, pharmacy n=15) and focus groups (n=21). Through these mediums the following issues were identified. 36% of patients surveyed voiced concerns about a lack of information in terms of what they were waiting for and what time they would be discharged. 50% of patients felt the layout of the transit lounge was not welcoming and said it was difficult to see nursing staff from the seating area. 65% of patient raised concerns around the lack of hot meal service and tea and coffee accessibility. Cultural resistance by ward staff (including nursing unit managers, nurses, pharmacists and medical staff) about transferring patients to the transit lounge. No formal business rules for the transit lounge, such as opening hours. No link between the transit lounge and patient flow bed priorities. Limited, duplicating paper records of the patient journey through the transit lounge. In order to address patient complaints regarding lack of food service, work was undertaken to have the transit lounge recognised as a ward area on the HealthShare food service system. This enabled a set number of hot meals to be delivered to the transit lounge each day for lunch service. Hospital volunteers were engaged to support the transit lounge during peak times of 11am to 3pm daily. Their agreed role is to help nursing staff to orient the patient to the transit lounge, assist with meals and support staff and patients with incidental needs and directions, etc. This has aided in more effective visibility of hospital staff for the patients, providing a welcoming environment and addressing patient needs. Plans have been drawn to address the physical layout of the transit lounge in a way that improves visibility and capacity through the reduction of non-essential partition walls. The layout proposed will increase capacity by six chair spaces, with the potential for more. Exact layout will be determined pending receiving quotes on current suggested layout options. Transit lounge business rules have been drafted as a means to provide ward staff with a simple to use guideline on patients suitability for transfer to the transit lounge and provide reference for the ideal steps undertaken to transfer a patient. These will be distributed to inpatient units and included on patient flow ward in-services. and addressing cultural resistance to transit lounge use. Marketing materials including posters (infographics aimed at debunking common misconceptions including opening hours, patient inclusion/exclusion criteria) and brochures (for patients with information and frequently asked questions addressed) will be developed and posted in the wards, to increase awareness of the transit lounge among patients and educate them on how best to use the service. 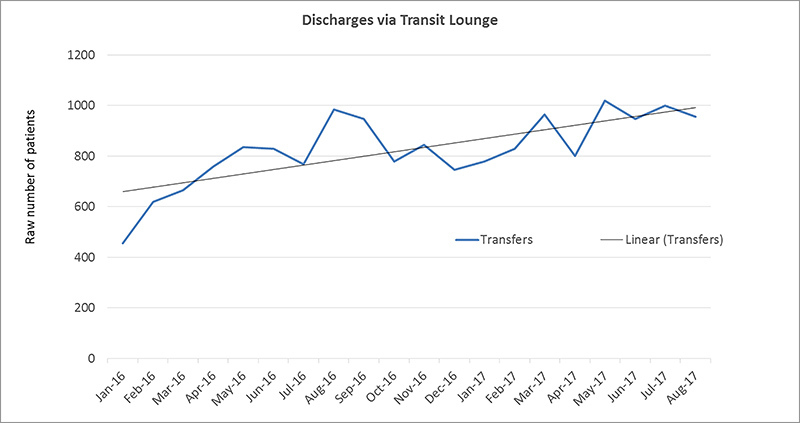 hospital discharges that are facilitated by the transit lounge, measured via an audit. 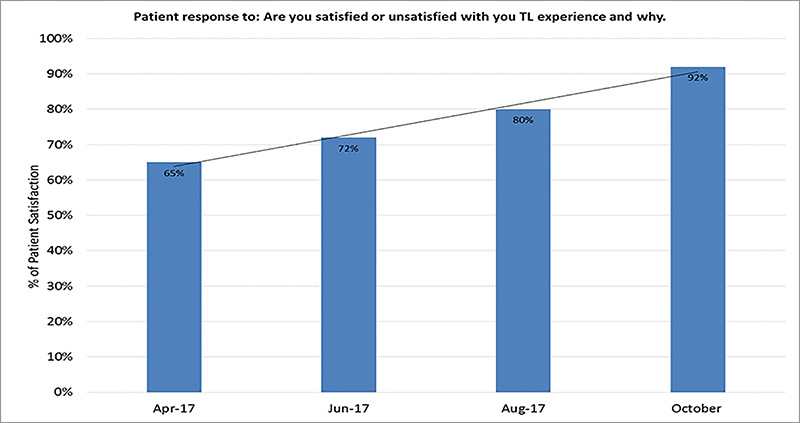 Results to date show that patient satisfaction with their experience in the transit lounge increased from 65 per cent in January 2017 to 92 per cent in October 2017. 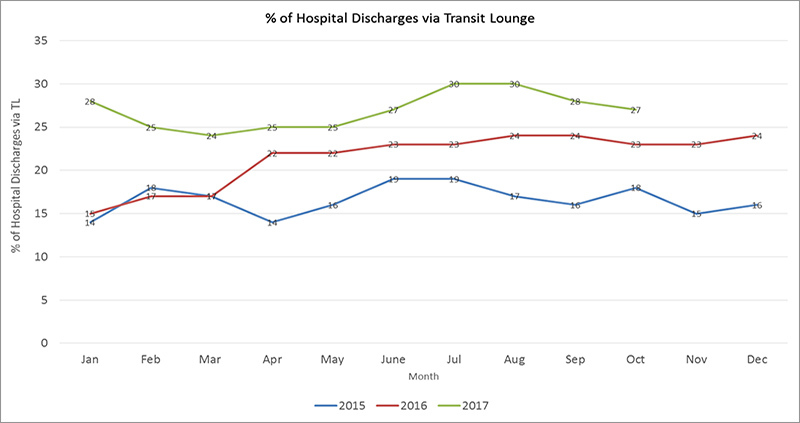 The number of hospital discharges facilitated by the transit lounge increased from 14 per cent in 2015 to 28 per cent in 2017. Continuous engagement and involvement with key stakeholders, including nursing unit managers, team leaders and pharmacists, is vital to the success of the project.